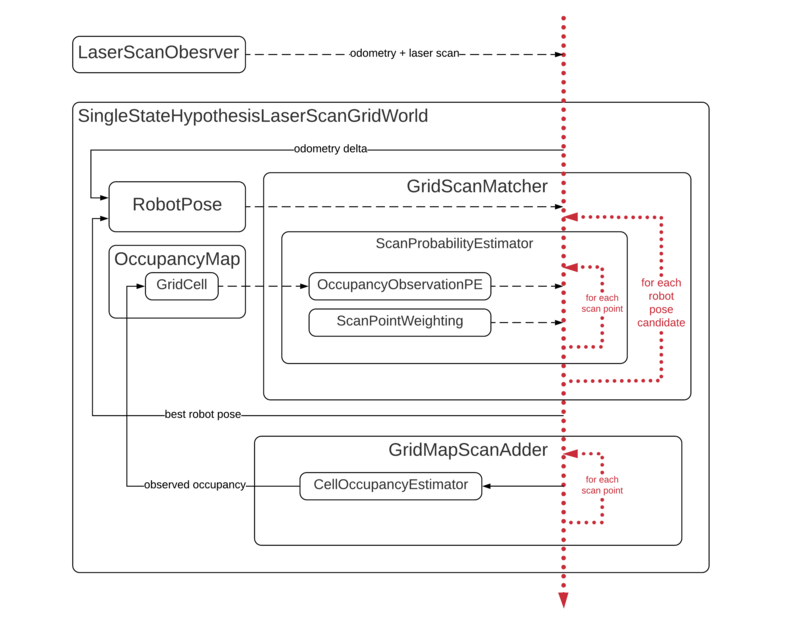 The SLAM constructor framework provides common functionality and classes that may be used to create custom SLAM algorithms (currently only 2D laser scan-based methods are supported). It also includes implementation of several SLAM algorithms: tinySLAM, vinySLAM and GMapping. They show an example of the framework usage and can be used as a base of a new SLAM algorithm. Current implementation requires odometry data and laser scans to be provided by the ROS topics (see Subscribed topics). It also supposes that a laser scanner is fixed in (0, 0) of a robot and mounted horizontally. In order to run an algorithm on data received in real time you can remove a dataset player node from a launch file, but make sure that sensor data are provided through subscribed topics. /tf (tf/tfMessage) – should provide required transforms. The current estimate of the robot's pose within the map frame. Frame ids can be configured. The package provides the utility lslam2d_bag_runner to launch algorithms in the offline mode to process datasets in BAG format.